In partnership with the Department of Energy Southeast Clean Energy Application Center, the International District Energy Association (IDEA), a nonprofit trade association created to facilitate the exchange of information among district energy professionals, is hosting a free webinar on November 17, 2011 (1:000-2:00 pm EST). The webinar, entitled "District Energy and CHP - Valuable Infrastructure for Sustainable Communities", will provide insight into the emergence of district energy in North America and will include two case studies that highlight its' success. Speakers will include Robert Thornton, President and CEO of the IDEA, Ray DuBose, Director, Energy Services at UNC-Chapel Hill and Harry Ragsdale, President, Thermal Engineering Group, Inc.
Nationwide Boiler has been a proud member of the IDEA and we support the organization's goals of promoting energy efficiency and environmental quality through the advancement of district heating, district cooling and cogeneration. Nationwide Boiler will be exhibiting at this year's 23rd Annual Power-Gen International trade show, December 13-15, at the Las Vegas Convention Center in Las Vegas, Nevada (booth 1216). Members from the Company's Sales and Marketing groups will be on-site to provide attendees with information about Nationwide Boiler's complete line of new and used low NOx boilers including trailer-mounted boilers, skid-mounted boilers, mobile boiler rooms, environmental emission controls and auxiliary equipment for the power generation market. Members from Nationwide Environmental Solutions, a strategic business unit of Nationwide Boiler, will also be in attendance, showcasing the CataStakâ„¢ selective catalytic reduction system (SCR), capable of reducing NOx emissions as low as 2.5 ppm.Power-Gen International, owned and produced by PennWell, is the industry's largest power generation conference and trade show. The show attracts more than 17,000 industry professionals, representing 76 countries. To receive a complimentary exhibit floor pass, please contact Nationwide Boiler at info@nationwideboiler.com or submit an online request at www.nationwideboiler.com. On April 14, 2011 Duke burned the last of its remaining stock of coal from its famous black mountain off Coal Pile Drive. As part of Duke's Climate Action Plan to become carbon neutral by 2024, the University is converting its West Campus steam plant from a coal-burning plant to a natural gas-burning plant. 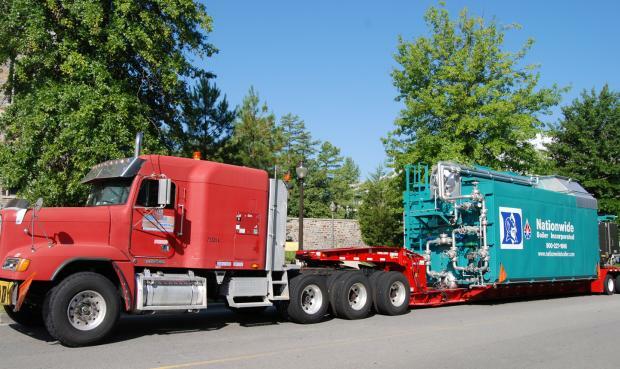 To aid in the University's efforts, Nationwide Boiler supplied a temporary 82,500 lb/hr trailer-mounted boiler for the plant, proudly delivered to the University with their Blue Devil logo. The boiler will be used until next Spring while the West Campus Steam Plant acts as a "base plant", along with steam produced at the East Campus plant, to heat Duke's buildings, sterilize surgical equipment and maintain proper humidity for art work and lab research. Duke's director of Sustainable Duke, Tavey McDaniel Capps, said Duke's steam plant renovations make it a leader for other colleges and universities who are also focused on helping the environment. "This kind of step is pivotal in our effort to move closer to carbon neutrality," she said. "Being proactive in our sustainable efforts will make a big difference in the future." Maintenance budgets are among the first to be cut when companies need to decrease costs. Unfortunately, this means that critical equipment, such as the safety of combustion equipment, may be overlooked, specifically the testing of fuel trains. Gas trains regulate the amount and the pressure of gas to the boiler's burners and are used to eliminate gas from entering the combustion chamber. This is achieved through a series of shut-off valves that are specifically designed to close when the combustion process occurs (through safety shutoff and blocking valves). Gas trains also include a series of pressure switches that prevent gas under pressure from entering the burner. If anything should go wrong, shutdown would occur immediately. As crucial as gas trains are for the safety of the boiler, many facilities are unable to perform the preventive maintenance and testing work on the equipment as should be necessary to help decrease combustion incidents from occurring. John Puskar (Combustion Safety Inc.) has developed the following strategies that can help any facility to be proactive in the maintenance of fuel trains and combustion equipment. Overall, the goal of any safety program is to improve the reliability and life of boiler related equipment. These guidelines not only help to achieve those goals, but more importantly they help lead to fewer unplanned outages and improve the overall safety of plant personnel. 1. Most of the explosions and fire incidents, by far, have historically been due to human error. All of the safeties and interlock equipment in the world won't help if you attempt to bypass or jumper-out safety controls. There is no possible substitute for proper training. Training has to include mock upset and hazard recognition drills. Your site needs training even if you will have contractors doing preventive maintenance work. 2. Start-up and shutdown are your biggest risks. You need clearly written procedures that everyone understands and agrees with so that consistent, safe practices are in place with every shift and every employee. 3. Make sure that you do regular and complete interlock and fuel train valve tightness testing. Jurisdictional inspectors, even where they are mandated to be around, cannot be at your facility every day. Combustion equipment safety testing needs to be part of your organization's culture regardless of what it costs and what the perceived hurdles are. You should comply with code requirements for testing even if they are not enforceable in your area. 4. Create corporate guidelines for third party combustion equipment reviews and commissioning for newly acquired equipment or for major upgrades. Now that you see how little review and attention combustion equipment may receive from the time it's specified to when its really operating, you may want a dedicated professional review of the process. 5. Upgrade equipment for safety's sake. Do not wait for a problem and let attorneys dictate when this happens.